What's The Number One Reason People Die Early in Your Country? But how do all these people die? Unsurprisingly, where you were born plays a major role in just how you shuffle off the mortal coil (or are dragged off of it). In Africa, preventable diseases are a common killer due to poor health infrastructure across the continent. But in Saudi Arabia car accidents are the leading cause of early death, despite only 50% of the population being allowed to drive. 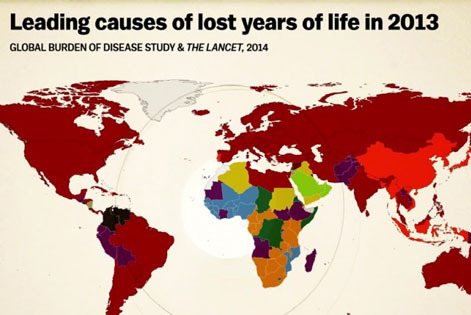 Hundreds of researchers around the world collaborated to create a map detailing the number one cause of early death is in the country and Vox has put the following video together to show you around it.